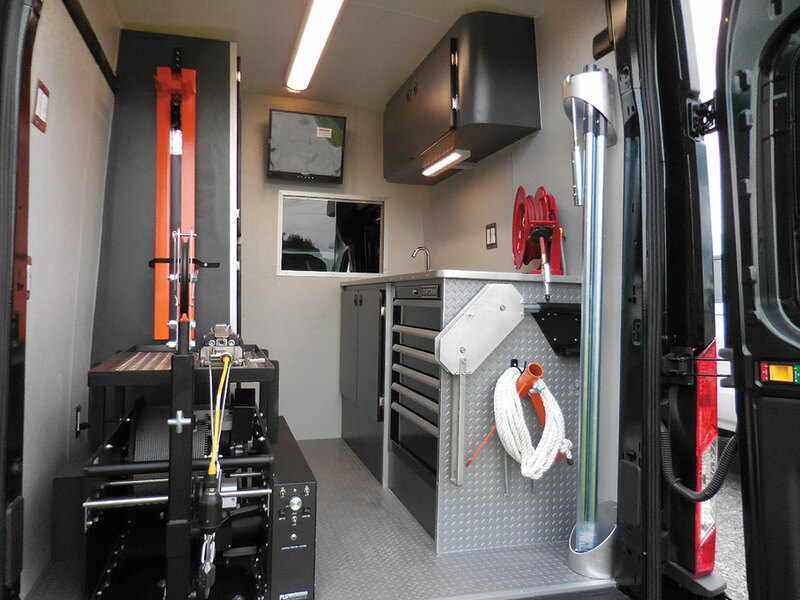 A cost-effective, custom, build-to-suit Ford Transit inspection van from Subsite Electronics is a smart choice for today’s pipeline contractors and larger municipalities alike—cutting-edge, single conductor technology paired with an ergonomic van makes this configuration well suited for municipal and industrial applications. Our true “plug and play” components can be added onto existing systems, without the need for additional system controllers or upgrades. Cameras, transporters, lateral launchers, cutters, laser profilers, etc. can all be easily and precisely operated on one single conductor. Longer inspection runs, smaller diameter cable, greater cable strength, and superior warranties all come standard with Subsite’s equipment and vehicle builds! The Ford Transit is available with either a diesel or gas engine and offers a compact footprint for ease of driving and maneuverability in tight access areas or on narrow roadways, with a budget-friendly price point for reducing fleet lifecycle costs.